In the world of eSports and competitive gaming, there are but a few names that stand out. Brands that are the pick of the bunch for any competitive multiplayer games, such as Call of Duty, Tekken, and Dragon Ball FighterZ. 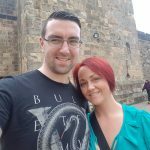 One such brand is Scuf Gaming, founded in 2010 by Duncan Ironmonger (what a name). Their controllers are famous now with eSport legends such as OpTic, Rise Nation, Luminosity, TK, Faze, Splyce and EnVyUs using their products at worldwide tournaments. Why though? What is so special about their products that world famous gamers are preferring to use them over the likes of Razer, whom we have reiterated many times on Gaming Respawn possess usually awesome tech (see our review of the Razer Wolverine Xbox One controller). I have been given the opportunity to see firsthand what is so special about Scuf’s tech as they have kindly sent us a Scuf Impact PS4 controller to check out. The Scuf Impact came in really nice packaging strewn with Scuf’s ‘S’ logo in blue. Opening it up allows you to see the controller in all its glory in super secure foam padding to keep it from getting damaged. I received the Cyber Skulls design, however; on Scuf’s website, there is a really great collection of designs to choose from, even eSport team logos and an Avenged Sevenfold design, if you just so happen to be a fan. The Cyber Skulls design covered the entire front fascia of the controller in orange intricate artwork clearly based on the endoskeletons found in the Terminator films. It’s an absolute thing of beauty. Once I realised I was staring mouth agape, I pulled the controller from its housing to find the rear of the controller had bubbly rubber handles that are anti-slip grips. It felt weird at first, but you quickly get used to the feeling and realise how comfortable it actually makes holding the controller for long periods of time. Think of the bubbly design like a paint spatter pattern, it’s really slick. The face buttons and direction pad buttons were all gold coloured and fit nicely with the aesthetic of the Cyber Skulls design. There are no images on any of the buttons other than the Scuf logo on the PlayStation ‘home’ button, so noobs beware. 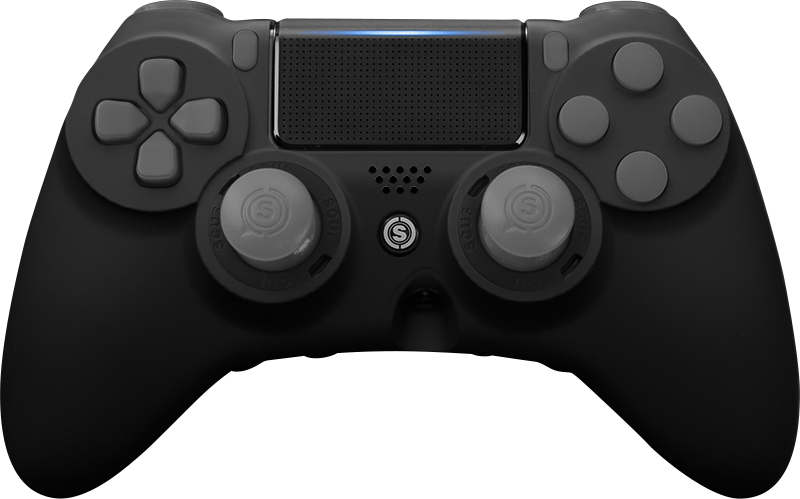 Using the Scuf Impact is not far away from using a standard DualShock 4, with the only difference being the main attraction that is the four paddles on the back of the controller situated between the two handle grips. Shaped to be discreet, these extra buttons impressively don’t get in the way and are not easy to trigger accidentally as your middle and ring fingers rest on them nicely. They are easily programmable using a small rubber dongle that comes included with the controller that has to be placed in the space between the two centremost paddles. You then hold the paddle you want to reprogram and press the button you want to assign to it. Once you remove the dongle, you can then use that paddle for the assigned buttons’ functions. This will allow you to perform actions in-game that may have been difficult before, such as jumping and shooting in Call of Duty, or perform combos more easily in fighting games. L2 and R2, face buttons, the thumb sticks and the paddles can all be removed and replaced. The L2 and R2 buttons can be replaced with extended triggers, making them easier to press, the thumb sticks can be removed and replaced using the included key, and the face buttons and fascia can be removed and replaced with different designs or colours, which are sold separately. The customisation options are extremely impressive. The paddles are the same; however, these things require extra care as they are flimsy. They pull off with a worrying bend before snapping off completely. That’s not to say they aren’t secure when fitted, quite the contrary, but if you decide you want to replace them, be mindful of how easy it may be to snap them in the most unwelcome places. The Impact is shapelier than its Infinity and Vantage brethren. The PS4 shape is fuller here, sporting a look more reminiscent of an Xbox One controller with the 3.5mm headphone jack fitted smack bang in the middle. Although it’s unsightly, it is handy and, thankfully, whatever design you choose to have in the front of your Impact, the jack doesn’t ruin it. Hell, you probably won’t even be able to see it with darker designs. 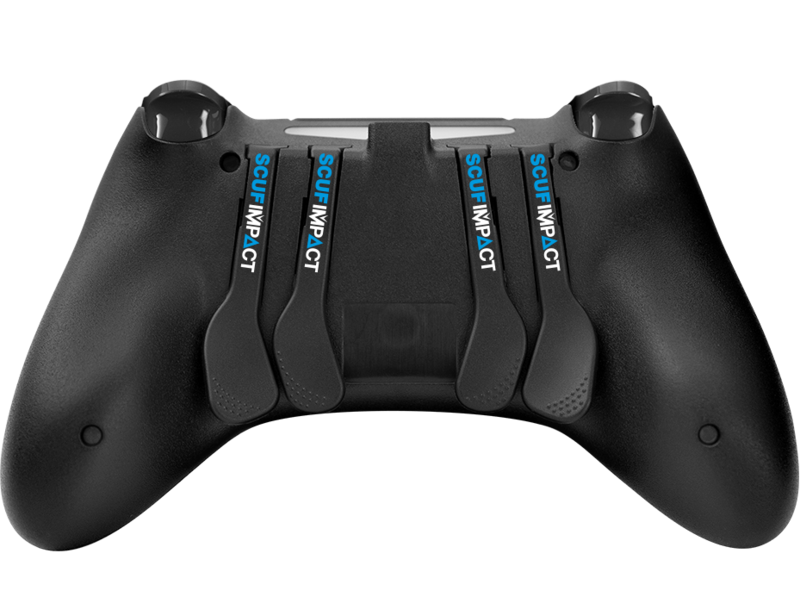 So, what’s so special about choosing the Scuf Impact over the likes of Razer’s Raiju PS4 controller? Its designs are mouth-wateringly awesome. There’s no mistake that you will look the dog’s testicles turning up to a competition and whipping one of these bad boys out. The paddles are special too, their placement and ease of use is unprecedented. Then there are the almost unlimited customisation options. Scuf Gaming, you’ve stolen my heart. 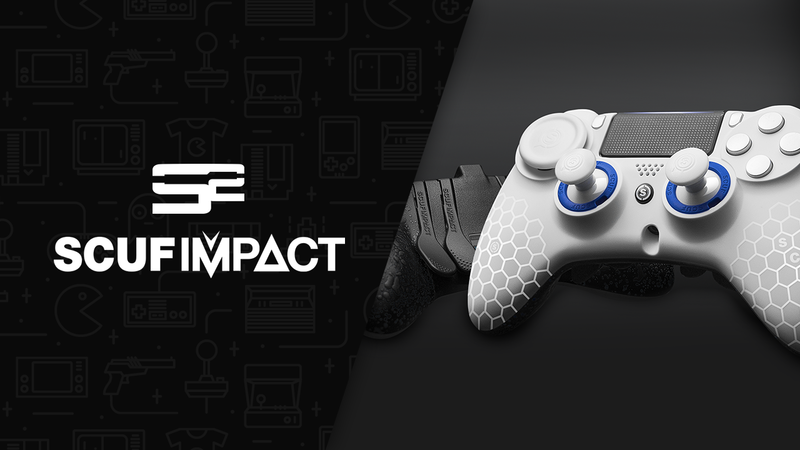 The Scuf Impact is a fantastic choice for a high-end controller. 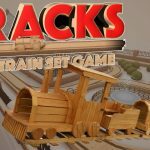 The breathtaking customisation options, mental design choices and ease of use makes these things a cut above the rest.